And which awards we'll jeer or toast. Come raise a glass! It's a good time. With particular attention to the work of writing, as I have about two hundred quotes on that topic; and also happiness, vocation, time, discipline, excellence, and the meaning of life. Don't say you don't have enough time. You have exactly the same number of hours per day that were given to Helen Keller, Pasteur, Michaelangelo, Mother Teresa, Leonardo da Vinci, Thomas Jefferson, and Albert Einstein. -- H. Jackson Brown, Jr. Normally I don’t ask for help from readers three times in eight days, but: I have been hired to write an article based on my talk The Art of Detection: One Editor’s Tips for Revising Your Novel. (This will actually be just the second time ever I’ve gotten paid for my own writing—and hey, getting paid for one’s thoughts is pretty cool!) But before I go forth dispensing my wisdom to all and sundry, I wonder: Is it really wisdom? If you’ve read the talk, have you tried any of the techniques? Did any of them seem particularly helpful, or NOT helpful? Anything I should push further? Drop altogether? Are there revision topics you wish I had covered that I didn’t—e.g. actual practical techniques for working through a revision, like, say, “Keep a running outtakes file”? While goodness knows not every technique works for everyone (so I'd expect a wide variance in answers here), your honest constructive feedback is appreciated. Many thanks! A. There are three kinds of sweet tastes. 1. The Dry Sweet. That is, dry in texture, with little internal moisture (and often hard), but still sweet in taste. Examples: sugar cookies, shortbread, vanilla wafers, the chocolate part of an Oreo, gingerbread men, the crust of a pie or crumble, brownies, the plain digestive biscuit. 2. The Creamy Sweet. Creamy in texture; the sugar level can vary. Examples: the creamy filling of an Oreo, the chocolate on a chocolate-covered graham cracker or digestive biscuit, the marshmallow in a Mallomar (also the outside), the peanut butter in Little Debbie's Nutty Bars, whipped cream or ice cream, caramel, pudding. 3. The Fruity Sweet. AKA the tangy sweet, sharper in taste, but still with a sweet takeaway. Examples: the raspberry filling of a rugelach, the fruit in a crisp, pie, or cobbler. 3a. The Banana Exception: Because of its texture and relative blandness, Banana shall be regarded as a creamy sweet, not a fruity one. B. The most delicious desserts involve two, but no more than two, of these sweet tastes (but see also point C). 1. Proof: Oreos, linzer tarts, Mallomars, s'mores, Moon Pies, oatmeal cream pies, McVitie's Plain Choc digestive biscuits, tiramisu, chocolate-dipped strawberries, cheesecake, caramel-covered apples, Twix, Thin Mints, those Girl Scout peanut butter sandwiches, pain au chocolate, black and white cookies, rugelach . . .
2. Many desserts involving only one type of sweet can be improved by adding another: chocolate-dipped graham crackers, for instance, or the cheesecake brownie, or the brownie a la mode, or ice cream with fruit sauce, or banana pudding with vanilla wafers. 3. The Jaffa Cake Exception: Jaffa Cakes are the only known dessert to successfully integrate all three sweets. C. The Add-On Exception: Many desserts involving two of the three sweets can be improved by adding the third on top. 1. This exception should be invoked with care, however, as the third can also be disastrous. 1a. Examples of Positive Add-Ons: Whipped cream or ice cream on a fruit pie or crumble; strawberry shortcake; cherry cheesecake; cherries or strawberries on a hot fudge sundae; chocolate-dipping a linzer tart. 1b. Examples of Negative Add-Ons: Anything fruity ever added to an Oreo. D. Taken as a whole, the most satisfying dessert spreads will invoke all three types of sweet, and allow the diners to construct their own combinations of tastes. 1. Proof: One can construct a perfectly good dessert table with berries, chocolate pastilles, and shortbread cookies. Or fondue! The floor is now open for discussion and debate of this hypothesis. Evidence (e.g. recipe links) welcome. Isaac Hayes: Rolling in His Grave or Digging It? I just finished writing an important e-mail, so, as I try to do whenever I have time, I clicked away for a quick mental distraction so I could come back and reread the e-mail with fresh eyes. The first minute is fun, but stick around for the whole thing. It's worth it. I've been doing a lot of housekeeping today -- scrubbing down the tub, cleaning out the refrigerator* -- and I finally fixed up my website a little bit too, updating my upcoming appearances and correcting the link to the bad-picture-book demo in the picture-book talk. If you find any other broken links or missing pieces on the website, would you please drop me a line at chavela_que at yahoo dot com? Thanks ever so! * Thanks to my antioxidant-obsessed boyfriend, we had not one, not three, but six tubs of blueberries in various parts of the refrigerator -- four of them now dried blueberries, which I'm saving for future baking. And four packages of baby carrots. New Year's Resolution for this household: Eat the fruits and veggies we bring home. 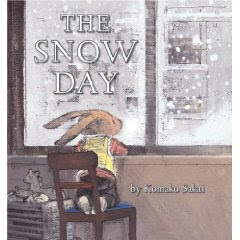 The Snow Day by Komako Sakai. As I write this, it's cold and gray outside, with a snowflake occasionally drifting its way past my windowpane. And I have never read a book that captures so beautifully and accurately the experience of watching the snow fall as The Snow Day, about a little rabbit who gets the day off from kindergarten and the quiet day that follows, waiting for the snow to stop and Daddy to come home. Already the recipient of three starred reviews, including this one from SLJ. 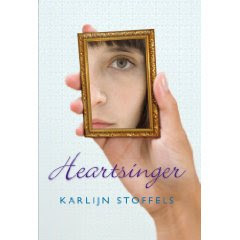 Heartsinger by Karlijn Stoffels, translated by Laura Watkinson. During the editing process, I referred to this fondly as "my weird little Dutch book," because it's one of those books that challenges our traditional American expectations of what a novel should be, and so requires the reader to adapt to it rather than judging it by those traditional expectations. (See also: The Legend of the Wandering King; I'll write more about this when I do a "Behind the Book" post.) And not all readers will adapt to it, and not all readers will like it. But those that do read it will discover beautiful, lyrical, magical-realist writing; a wonderful fairy-tale-like atmosphere and story; and a deep understanding of love and the problems of love between man and woman, and parent and child. And indeed, challenging those traditional American expectations of what a novel should be is partly why we do translations, so I hope readers will be willing to meet Heartsinger halfway. 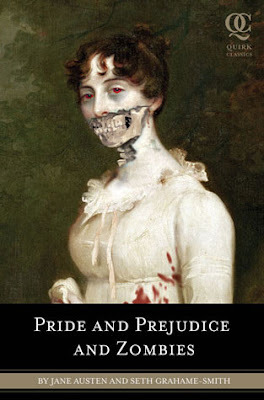 The beautiful cover was designed by Elizabeth Parisi (who also created the cover for Maybe below). Starred review from Kirkus. 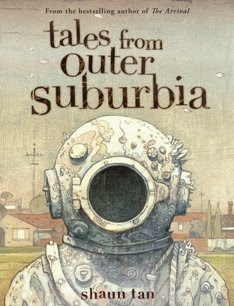 Tales from Outer Suburbia, by Shaun Tan. The followup to Shaun's amazing The Arrival has more text (much more, as The Arrival was wordless, and this is a collection of short illustrated stories), but just as much wonder, terror, humor, wisdom, sympathy for the human condition, and astonishing art. Two starred reviews. 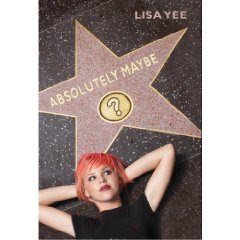 Absolutely Maybe by Lisa Yee. Every time I go to Los Angeles, including my recent holiday trip, I think about this book, because -- besides being Lisa's first YA novel, a terrific portrait of a girl figuring out who she is and what she wants, and funny as heck, especially thanks to the wonderful supporting characters -- it is a love letter to L.A., in all its gritty, glamorous, car-dependent, movie-besotted, great-Mexican-food-containing glory. And as I do not generally love L.A., I am grateful to Lisa for writing a book that makes me appreciate it, especially the Mexican food . . . Seriously, it's probably not wise to read this book unless you have a good taco place within a five-minute walk or drive. (This book was called Definitely Maybe until we learned about the movie last spring -- damn you, Ryan Reynolds!) Out in February; see advance reviews here. 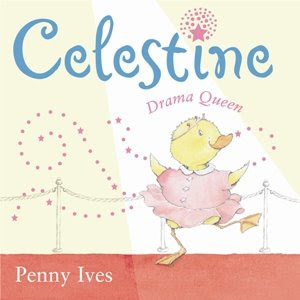 Celestine, Drama Queen, by Penny Ives. A little duckling diva just knows she'll be the star of the kindergarten drama . . . and indeed she is, if not in quite the way she expects! A perfect book for all fans of Fancy Nancy or darling ducks. 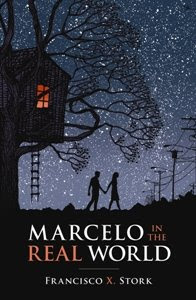 Marcelo in the Real World by Francisco X. Stork. I wrote about this book here and I will write more about it closer to its release in March, but for now I'll just say it's about a young man with a form of autism who spends a summer working in his father's law firm; it's a love story, a legal drama, and a religious inquiry into our human response to suffering; and while that may sound dry, it's full of life, and extraordinary. We've sold rights in four foreign languages thus far (Italian, Spanish, German and French), and it too is receiving some good love over in the advance Amazon.com reviews. The lovely, perfect cover is by Dan McCarthy, who has also created posters and t-shirts for Harry and the Potters, though our designer Chris Stengel knew him from posters for other bands around Boston . . . which goes to show you never know where someone may discover your illustrations. Out in March. Are You a Horse? by Andy Rash. Sometimes, when I'm in need of a break at work, I will go over to my friend/our editorial assistant Emily's cubicle, hang over the side, and stare at her thoughtfully. "Emily?" I ask. "Are you a horse?" 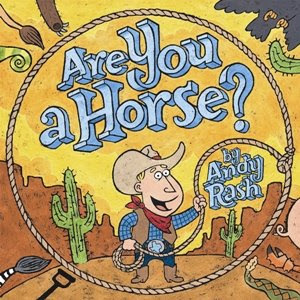 This never ceases to amuse me (though I imagine Emily might be tiring of it), and it also reproduces the process of inquiry that our hero Roy the Cowboy goes through: He has a saddle, but no horse to ride -- in fact, he doesn't even know what a horse is. So he asks a cactus, a wagon, a crab, a lion, and various other animals whether they are a horse, using their answers to come to an eventual definition of a horse. A great book for all budding scientists, and hilarious to boot, thanks to Andy's brightly colored pictures, the witty text, and the twist ending. Out in March. You never know . . . you might be a horse too. I'm feeling blissfully lazy and so don't have much more to say than that. Wishing you all blissfully lazy beginnings -- and then productive and enjoyable new years -- as well!